So many friends have asked me what the heck is wingin' it. Well simply put it's what I usually tell my kids when they ask "mom what's for dinner"? I'm not a big plan the meals a week in advance kind of cook. My husband works a swing shift and too many times I have planned dinner only to get "mom can I go to so and so's house or mom can the guys come over and hang out". This usually means too much food or not enough food. So I try to keep essentials in my pantry and freezer and when it's time for dinner I wing it. The majority of the time it's a great success with the family saying make this again. Then there are the disasters...thank goodness for pizza! So now I am following it modified. But really, when I look at the way I am eating now, it is really close to the diet anyway. I have also looked into eating Paleo. Paleo is really restrictive though and with kids and a husband who wont follow it its hard to do. But I really want my family to eat healthier. I want my kids off sugar or as much as I can get them off of it and I don't want them eating gluten as it also causes many of the ailments as candida. When you think about it, it makes sense, eating bread and gluten products causes an insulin response which converts those bad carbs to sugar which feeds the bad bacteria (candida). It goes on and on and wont stop unless you stop feeding the little buggers! OK enough of that. In my quest for better health I have been looking all over the web for recipes. There are a zillion! I have purchased a few cookbooks. All are good but not all of them will fit with my family. That's where I start winging it! The recipe that I am going to share is one that I played with and modified until I got an amazing result. I hope that you enjoy it. I use frozen mixed berries but you can use fresh as well. Place the frozen berries in a saucepan, sprinkle with 1 tsp of sweetener, heat on med/low until they thaw and start to release their juice. Let them cool a bit then puree them, set aside. Mix your dry ingredients in a bowl, add melted butter, extracts and mix. Add the beaten eggs and mix again, then add the pureed berries and mix until well incorporated. Now you have a choice of how to cook these. I made these in a 24 count mini cupcake pan but you can also make regular size cupcakes or for fun and if your in a hurry you can make this as mug cakes. For cupcakes heat the oven to 375. Measure about 1 tsp of batter per cupcake and bake for 18-20 or when a toothpick comes out clean. Cool before frosting. 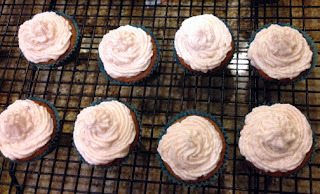 Cooking is similar for regular cupcakes but you might need to adjust the timing. Check with a toothpick after 20 min and use your best judgement. When I give these a go as regular cupcakes I will update this post. For mug cakes, lightly spray each mug with your spray of choice, then divide the batter equally between the mugs. Microwave for 90 seconds then check for doneness. Add a few seconds at a time if needed. Don't over cook! You can either eat them right from the mug or use a small knife around the edge and release onto a plate. This will make enough for 24 mini cupcakes with a bit left over. Using your mixer cream the butter and cream cheese with the sweetener until fluffy, add the heavy cream, the extract and continue to beat on high until it starts to get thick and fluffy. At this point you can add the puree and then continue to whip until it holds its shape. Please note that if you use the pureed berries that the frosting will not be as thick but you can chill it for a few minutes before frosting the cakes. There are many out there. Some are pure garbage and are unnatural, others are natural with added garbage that usually translates to sugar. YES some of these no calorie sweeteners contain SUGAR. You gotta read those labels! "In the Raw" is a prime example. I purchased a box of "Stevia in the Raw"only to realize the first ingredient is dextrose--SUGAR! There are a couple of sugar alcohols that are good to use, erythritol and **xylitol. They can sometimes cause digestive issues in sensitive people but I have not had an issue with either. Most the reports I have read say similar that their are no digestive issues with them. Neither has caused the problems that maltitol causes and that is what you will find in a lot of commercial "sugar free" foods. You can use pure Stevia but use sparingly as it is 300 times sweeter than sugar. The brand of sweetener I use in my baking is Swerve. It is erythritol and oligosacharides. It is natural, non-glycemic, non-gmo. I purchase it from Amazon.com. You can find good granulated sweeteners at the better markets or health food stores but if you can't then the best option at the regular grocery store is Truvia. It is a mix of erythritol and stevia and natural flavours. The "natrual flavours" is questionable but this is a better choice than Splenda. Just stay away from the baking blend since it is mixed with sugar. I really recommend that you Google these sweeteners to get a better understanding of them. It will really help if you do decide to go sugar free and want to convert recipes. Some say they can be swapped cup for cup with sugar but others cant so please Google them! **XYLITOL is toxic to pets especially dogs. It affects the blood glucose level in pets to dangerous levels and can cause death. Do you chew sugarless gum? Most is made with xylitol. What I have read on the subject is that sugarless gum or mints are the #1 cause of emergency room visits for dogs. So even though it is beneficial for humans our pets cannot eat it so no goodies for the pets! One who understands the details, technique, or principles of an art and is competent to act as a critical judge.